Some sunscreens now contain nanoparticles, smaller than 100 nanometres in at least one dimension. Such nanomaterials may have physical and chemical properties which differ from earlier preparations of the same substance. The material in question, zinc oxide, has previously been tested in the form of micro particles to ensure it is safe. New data is needed to indicate whether the nanoparticles are safe for use in products applied to the skin. It has now been reviewed in detail. Why use ZnO nanoparticles in sunscreens, and what are they? What are the properties of ZnO nanoparticles? How have ZnO nanoparticles been tested for safety? Do ZnO nanoparticles pass through the skin? Are sunscreens using zinc oxide nanoparticles safe? 1. What is zinc oxide used for? Zinc oxide is a largely inert, white compound which is used very widely as a bulking agent or filler, and as a white pigment. It is also used in a many cosmetic and medical products and in toiletries, as it has antibacterial and deodorant properties. It is often found in, for example, baby powder and anti-dandruff shampoos. Its strong absorption of ultra-violet (UV) light has led to its use in sunscreen lotions, for both adults and children. 2. Why use ZnO nanoparticles in sunscreens, and what are they? Standard production sees zinc oxide made from zinc vapour, and yields microparticles, typically a few micrometres (a millionth of a metre) across. These are good for making white pigment. They also make your sunblock white, which may stop some people using enough of it. Even smaller particles can be made which do not have this dense white colouring. They can be used in sunscreens which some people prefer because they do not appear as an opaque white layer on the skin. Such sunscreen contain nanoparticles – defined as measuring between one and one hundred nanometres in at least one dimension (a nanometre is one billionth of a metre). 3. What are the properties of ZnO nanoparticles? Some of the properties of nanoparticles may be different from larger particles of the same material. A battery of physical and chemical tests have been done on the zinc oxide nanoparticles used in sunscreens. They have the same crystal structure, and range of shapes, as micro-particles, and show similarity in most other physical and chemical characteristics which have been measured. Zinc oxide in this form is slightly more soluble than normal. 4. How have ZnO nanoparticles been tested for safety? There are now results from a wide range of standardised toxicological assessments of zinc oxide nanoparticles. They include tests for skin irritation, and other tests explored a range routes for internal exposure, including swallowing, breathing, or direct injection. 5. Do ZnO nanoparticles pass through the skin? It is particularly important to establish whether ZnO nanoparticles are more likely to penetrate the skin than microparticles. A number of different studies have now been reported, in animals and human volunteers, which monitor possible absorption through the skin, either of the particles themselves or zinc ions. The combined results indicate that a very small amount of zinc, in soluble form, may pass through the skin. The quantities are a good deal smaller than the normal levels of zinc found in the body. 6. 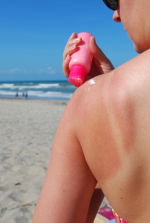 Are sunscreens using zinc oxide nanoparticles safe? This report concludes that products containing up to 25 per cent nanoparticles are as safe for use on the skin as those containing micro-preparations of zinc oxide. It is probably a bad idea to swallow sun lotion, but this is not likely to pose a major hazard. There remain some doubts about possible effects of breathing in zinc oxide nanoparticles. At the moment, however, there should be no sprayable sunscreens using nano-zinc oxide on sale in Europe. The Three-Level Structure used to communicate this Scientific Committee on Consumer Safety (SCCS) opinion is copyrighted by Cogeneris SPRL.